"It's the Magic in You Girl"
(1969) "I've Gotta Make You Love Me"
(1982) "Na Na Hey Hey Kiss Him Goodbye"
"Na Na Hey Hey Kiss Him Goodbye" is a song written and recorded by Paul Leka, Gary DeCarlo and Dale Frashuer, attributed to a then-fictitious band they named "Steam". It was released under the Mercury subsidiary label Fontana and became a number one pop single on the Billboard Hot 100 in late 1969, and remained on the charts in early 1970. In 1977, Chicago White Sox organist Nancy Faust began playing the song when White Sox sluggers knocked out the opposing pitcher. The fans would sing and a sports ritual was born.The song's chorus remains well-known, and is still frequently used as a crowd chant at many sporting events generally directed at the losing side in an elimination contest when the outcome is all but certain or when an individual player is ejected or disqualified. Paul Leka, Gary DeCarlo and Dale Frashuer wrote a blues shuffle version of the song in the early 1960s when they were members of a doo-wop group from Bridgeport, Connecticut, called The Glenwoods, The Citations, and the Chateaus, of which Leka was the piano player. The group disbanded when Leka talked Frashuer into going into New York City with him to write and possibly produce. In 1968, DeCarlo recorded four songs at Mercury Records in New York with Leka as producer. The singles impressed the company's executives, who wanted to issue all of them as A-side singles. In need of a B-side, Leka and DeCarlo resurrected an old song from their days as the Glenwoods, "Kiss Him Goodbye", with their old bandmate, Frashuer. With DeCarlo as lead vocalist, they recorded the song in one recording session. Instead of using a full band, Leka had engineer Warren Dewey splice together a drum track from one of DeCarlo's four singles and played keyboards himself. "I said we should put a chorus to it (to make it longer)", Leka told Fred Bronson in The Billboard Book of Number One Hits. "I started writing while I was sitting at the piano going 'na, na, na, na, na, na, na, na'... Everything was 'na na' when you didn't have a lyric." Gary added "hey hey". The group that is seen on the album cover and in the old black and white video was a road group that had nothing to do with the recording. The road group was lip syncing to DeCarlo's vocal in the video. "Na Na Hey Hey Kiss Him Goodbye" reached number one in the United States for two weeks, on December 6 and 13, 1969; it was Billboard's final multi-week number 1 hit of the 1960s and also peaked at number twenty on the soul chart. By the beginning of the 21st century, sales of "Na Na Hey Hey Kiss Him Goodbye" had exceeded 6.5 million records. 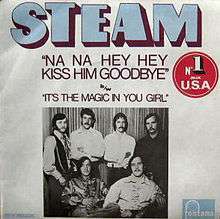 The original recording of "Na Na Hey Hey Kiss Him Goodbye" has been released in many collections of oldies songs and recorded by other groups. The Supremes included a cover of the song on their 1970 album New Ways but Love Stays. Dave Clark & Friends released the song in October 1973 under the title "Sha-Na-Na-Na (Na Na Hey Hey Kiss Him Goodbye)" (EMI 2082), but the single didn't chart. 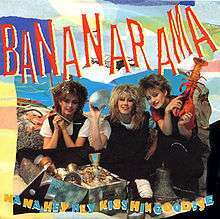 In February 1983, UK girl group Bananarama released the song as a single from their album Deep Sea Skiving. This version became a top ten hit in the United Kingdom (#5), but only a minor hit in the US (Billboard #101) later that year. In 1987, Canadian quartet The Nylons released an a cappella version of this song as a single under the shortened title "Kiss Him Goodbye". It became their biggest hit on the Billboard Hot 100, peaking at number twelve that summer. Nigerian Reggae artist Majek Fashek sampled the chorus for the song "Free Africa, Free Mandela". In 2009, Kristinia DeBarge heavily sampled "Na Na Hey Hey Kiss Him Goodbye" in her debut single "Goodbye." The song would eventually reach the top 20 of the Billboard Hot 100, peaking at #15. In 2009, American rapper Wale sampled the chorus line of the song in his single Chillin. The song peaked at #99 on the US Billboard Hot 100. In 2014 the Norwegian artist Adelén used the chorus line of the song on her World Cup song "Olé." The song was one of the tracks on the One Love, One Rhythm - The 2014 FIFA World Cup Official Album. The song peaked at number #3 in Norway. Steam's version appears in a 2015 TV commercial for Sprint. The song is often used as a sports chant aimed toward a losing team, popularized in particular by stadium organist Nancy Faust at home games of baseball's Chicago White Sox, and is often chanted in WWE events whenever a performer or authority figure (usually a heel) is fired, or an unpopular politician is defeated. It is similarly used by various clubs during Association Football matches when a player (traditionally from the away side) is given a red card and has to walk off the pitch. It is also used frequently in the 2000 movie Remember the Titans. On MTV's game show Remote Control, which was on the air from 1987 to 1990, the audience would often sing this song as a losing contestant was removed from the set.It was parody by Dash Rip Rock as "Marijuana, Marijuana, Hey Hey, Get High". This was the fifth single released from their first album in 1983. It peaked at number five in the UK singles chart, and number 38 in Australia on the Kent Music Report chart. The music video features the band playing in a school playground and then being made to move by a group of lads. They then decide to join a boxing club so the video features them singing the song whilst boxing. By the end of the video they return to the playground wearing leathers and this time make the group of lads move away. They then ride off into the night on motorbikes. ↑ "Steam Biography". Pandora Internet Radio. Retrieved May 16, 2011. ↑ Bronson, Fred (2003). The Billboard Book of Number One Hits. ↑ Whitburn, Joel (2004). Top R&B/Hip-Hop Singles: 1942–2004. Record Research. p. 550. ↑ Whitburn, Joel (2004). The Billboard Book of Top 40 Hits (8th edition). Record Research. p. 464. ↑ Trust, Gary (June 25, 2010). "Ask Billboard: Katy Perry, Christina Aguilera, Lady Gaga". Billboard. p. 2. Retrieved July 1, 2010. ↑ Kent, David (1993). Australian Chart Book 1970–1992 (Illustrated ed.). Sydney: Australian Chart Book. p. 25. ISBN 0-646-11917-6.